2013 has been an amazing year for Weaving Influence. We are grateful for the opportunities we’ve had to serve our clients and for the relationships we enjoy with our online communities, especially the bloggers/influencers of Team Buzz Builder. This has been a year of tremendous growth. We launched 16 books (compared to 7 in 2012), we added additional subcontractors to our team (growing from a core team of 6 last year to a core team of 17 now, with nearly 30 subcontractors total working on projects as we end the year), we added new services (web design/development and PR), and we serve more clients than ever before. I enjoyed in person time with clients, team members, and collaborators. 2013 began with a trip to Atlanta, where I strategized web design/functionality with a client. He hosted a dinner with prospective clients. (Wow!) Other great in person meetings: two trips to Berrett-Koehler in San Francisco, the opportunity to speak at Berrett-Koehler’s Author Marketing Workshop in Atlanta, two speaking engagements in Michigan, ASTD ICE conference with several clients (including the chance to gather several clients for a Mexican dinner), a trip to Vermont to meet clients in September, a meal with local Weaving Influence team members and clients at my home office this November. Though I purposefully limit my travel, I value and love working in person with clients (and my team!) and look forward to more opportunities in the future. We are enjoying long term relationships with clients and a strong referral network. We love partnering with our clients and count it a win that many work with us for a year or longer. We also love the collaborative relationships we form and the friendships that endure even after contracts end. We made several improvements to our website this year, launching the new weavinginfluence.com in May. We launched our author pages this fall, to bring more attention to the authors we serve. Our site is a work in progress and we have other improvements coming soon. We completed some beautiful websites for our clients this year including chatsworthconsulting.com, chipbell.com, erinschreyer.com, and a redesign on leadingwithquestions.com. We are launching one more before the end of the year for Kathy Cramer and have several in development to launch early next year. We are figuring out who we are, how we are different, and how we can work hard to continually innovate our processes to add more value for our clients. We keep learning and experimenting and our clients benefit! We are an influence building company for authors/thought leaders, with a focus on helping business/leadership authors launch books by leveraging social media and traditional PR. Our project management team is stronger than ever, thanks to two great additions this year and thanks to the coaching and direction of Susan Mazza, who’s been consulting with us this fall. The Weaving Influence leadership team consists of Carrie Koens (Book Launch Manager), Amy Driehorst, Megan Constantino (PR Director), and (our latest addition) Don Hornsby. Our website development team is Rachel Royer (design) and John Marcello (development.) 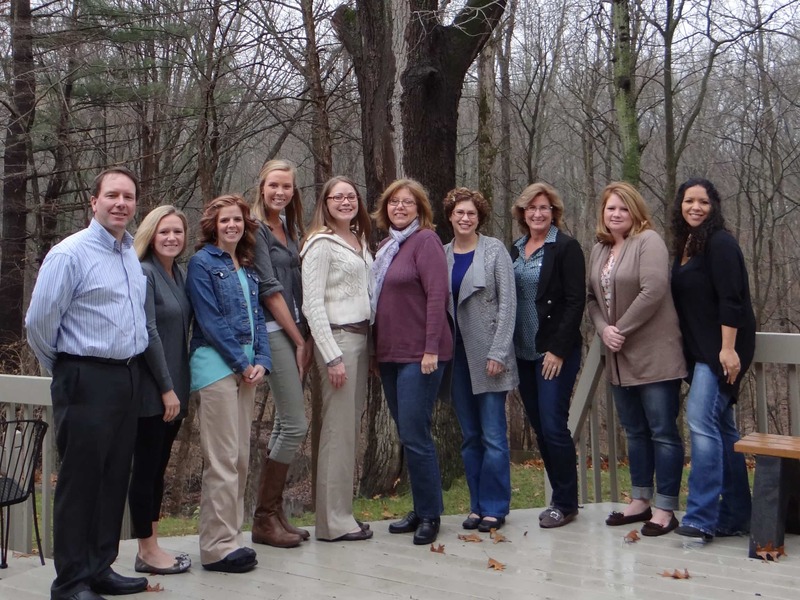 I am so proud of these professionals and their dedication to our clients. I’m also thrilled that our leadership team is connecting more closely with our clients and getting (much deserved!) praise and recognition for their work. On September 1, 2013, we became Weaving Influence, Inc. Now that we are a corporation, I am the first (and only) employee. We are continuing to find and cultivate strategic relationships. This year, we’ve collaborated with Berrett-Koehler, Lead Change, Linked 2 Leadership, and Careers in Government. In the new year, we will partner with DesignArounds and Julie Winkle Giulioni to expand our webinar services. These relationships help us serve our clients more effectively. I have dedicated help in my home office, expanded this summer. On a daily basis, Rachael DeBarr arrives to help with administrative details. She has been a true gift to me this year! Despite being new to the PR scene (starting in August 2013), we landed some choice placements for our clients this year by leveraging our VOCUS subscription, HARO, and PR Web news releases, including Women’s Health, Wall Street Journal, Business Investor’s Daily, Business News Daily, Entrepreneur Magazine, LA Times, Business Insider, SHRM Magazine, AARP, HR.com, Fox Small Business, Leadership Excellence, and The Huffington Post. Go Megan! We created some engaging and successful webinar events this year including The Leadership Opportunity Fest (hosted by Bill Treasurer), a conversation with Peter Block, Meg Wheatley, and Steve Piersanti, and launch related events for many of our book launches this year. Most recently, we marketed and hosted a webinar for a global audience/panel. We provided meaningful, flexible work opportunities for our subcontractors. The most-often heard benefit of working with the #witeam that I hear is that my team appreciates the flexibility our work offers. Above all, I am grateful for the opportunity to do work I love, with people I love, for clients I love. I appreciate the opportunity to serve, and I see God’s faithfulness as a thread of grace in all we do. Thank you for weaving influence with us! Thanks, David! I appreciate you! Being a part of the Weaving Influence team in 2013 has made this one of the most fulfilling years I’ve ever had in my professional career. A big thanks to Susan Mazza for making sure we all got connected. Looking forward to more exponential growth and progress in 2014! Much of what we’ve accomplished this year would not have been possible without you. John, I am beyond grateful for you and your friendship. Congrats on a banner year to everyone of the Weaving Influence team. You’ve done a remarkable job this year! Much to celebrate. Warm wishes to all for the holidays. Thanks, Jesse! I am exceedingly grateful for the ways you’ve encouraged, supported, and referred to me! Hugs! Thanks for sharing your success. And for being part of my team. You make an enormous difference. David, welcome back! I’ve missed you! I can’t wait to hear all that you learned on your adventure. Thank you for the amazing encouragement you’ve shared on my journey. 2014 will be even better!